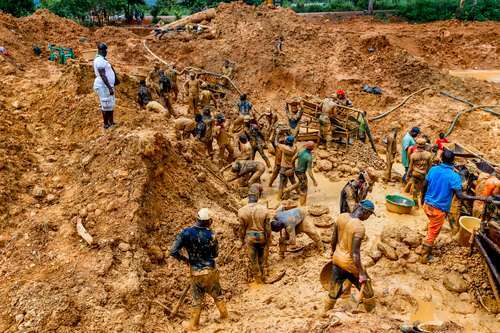 A 20-year-old boy died after he fell into an abandoned galamsey pit at Peminase near Bomfa in the Ejisu-Juaben Municipality in the Ashanti Region. The deceased, Yaw Boakye, according to reports reportedly went to work at a construction site close to the abandoned pit with his colleagues. An assembly member for the area, Mr Owusu Asante Ahmed who doubles as the cousin to the deceased narrating the incident to the media said “He [Yaw Boakye] went there as a labourer at the construction site so after the day’s work, all the labourers decided to go there and wash themselves in the abandoned Galamsey pit. He said an attempt by the colleagues to rescue him from the pit was not successful and they informed elders of the Peminase community about the mishap. The remains of Yaw Boakye, have since been deposited at the morgue of the Konongo-Odumase Government Hospital for autopsy. Abandoned galamsey pits over the years have fatally trapped many people with illegal miners and other small-scale miners leaving deep pits they dig up for their operations. Illegal mining, apart from polluting river bodies, destroying cocoa and other farmlands also accounts for the death of many miners. HAPPY BIRTHDAY PRESIDENT JOHN DRAMANI MAHAMA! Alan Kyeremanten to resign as Trade Minister?